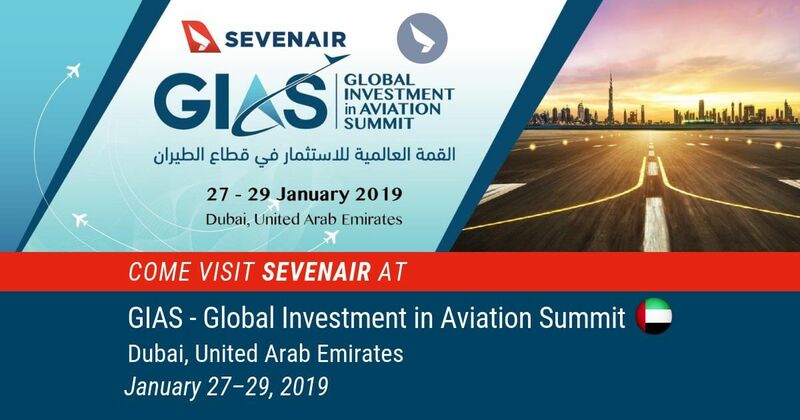 Sevenair Group and Sevenair Academy will attend GIAS summit to be held between 27th and 29th of January in Dubai, United Arab Emirates. We will have the opportunity to present our capabilities and discuss ways of expansion and cooperation with investors and key stakeholders of the industry. Come visit our team! “The summit coincides with the remarkable achievement of increasing the number of passengers through Dubai international airport to reach over one billion, as it was stated by His Highness Sheikh Mohamed bin Rashid Al Maktoum, vice president of the state, Prime Minister and ruler of Dubai who expressed his delight over holding the event in Dubai to exchange experiences and information between international experts in aviation sector, as well as holding partnerships that would support investment in aviation. The Global Investment Aviation Summit in Dubai highlights UAE’s leading regional role in aviation sector which is a key pillar in enriching the national economy”. GIAS 2019 will offer an ideal platform for ministers of aviation, airline companies and professionals in the air transport sector to keep them up-to-date with the latest developments on the airline industry, and allow them to gain insights into investment opportunities available in local, regional and global aviation markets.